Getting the best results from your insulation kit. It's no secret that polyurethane spray foam insulation kits are expensive. This guide is put together to better help you get the most out of your investment. Yields on all disposable foam kits (regardless of manufacturer) are calculated assuming that the foam will be sprayed under ideal conditions and with proper technique. There are numerous factors such as temperature, humidity, spray technique, etc. which all affect the consistency and yield of the resulting foam. As long as you meet the minimum requirements you will spray good foam. However, it is nearly always the case that one or more of the conditions are not ideal when you need to spray your kit. We feel that it is important for you to understand how these different factors can affect the performance and yield of low pressure disposable spray foam kits. There are three different temperatures we are concerned with in regards to spraying. They are listed below in the order of their importance. For more information and for several ideas to help maintain proper chemical temperatures, please read Temperature is Key. Tip: A good way to measure the chemical temperature is to shake the tank well and then use an infrared or laser thermometer aimed at the lower 1/3 of the tank. A cold substrate will pull heat from the foam reducing the amount of expansion. Too Cool Chemical reaction slows resulting in higher density, lower yield, and decreased adhesion. Too Warm Chemical reaction too fast resulting in higher density, lower yield, and decreased adhesion. Too Hot Chemical reaction disrupted, foam does not stick and slides down the wall. An example of this might be a sheet metal building in the hot sun. Tip: Spraying a thin flash coat is a method commonly used to help warm the substrate. Ambient temperatures of 32°F are about the lower limit at which you will even want to try spraying foam. Consider using a space heater to warm the area to at least 50°F. Tip: We do have customers that spray foam in freezing conditions. Just be sure to maintain proper chemical temperatures, insulate hoses, and warm the substrate to 50°F or more if possible. Plan on a moderate loss in yield when spraying in extreme conditions. Spraying technique can have a large affect on foam quality and yield. For best results, maintain a distance from the nozzle tip to the substrate of between 12 and 18 inches. Move the gun as you spray keeping the spray perpendicular (a 90° angle) to the substrate. Tip: Spraying with the gun more than 18" from the substrate may allow some of the expansion gasses to escape the from the chemicals. This results in a higher density foam and an overall lower board foot yield from the kit. Move gun with a slow steady smooth motion. Keep gun moving so as not to beat down foam that is expanding. Move the gun at a rate of about 1 ft per sec. Allow a minimum of 5 minutes between multiple layers. Holding the gun in one spot too long Higher Density Foam - caused by beating the foam down while it is trying to expand. Keep the gun moving slowly. Roughly 1 ft per sec. Spray what appears to be roughly 1/4" and it will expand to roughly 1"
Spraying over the top immediately Higher Density Foam - caused by beating the foam down while it is trying to expand. Allow the foam to fully expand (up to 5 minutes) before adding additional layers. Fast movement Thin or spotty foam with gaps. Pull trigger at least half way and move the gun at a slower rate. Tip: Attempting to spray foam too thin (less than 1/2") can result in a higher density foam and a lower overall kit yield. Ultra thin coats won't hold enough heat during curing to allow for full expansion. In general, it is best to engage the trigger at least 1/2 the way. For best results on a new kit, engage trigger between 1/2 and 3/4 the way. Full throttle When kits are full they contain maximum pressure. Pulling the trigger fully will spray at full force which can result in excessive splatter or over-spray. In a worst case, some of the foam may be lost due to bounce off the substrate. On a new kit, pull the trigger between 1/2 and 3/4. Barely engaging the trigger This is typically OK for gaps, cracks and small areas. However, prolonged spraying in his manner can start to cause off ratio foam. Pull the trigger at least 1/2 of the way. Tip: It is a good idea to stop and change nozzles as needed. 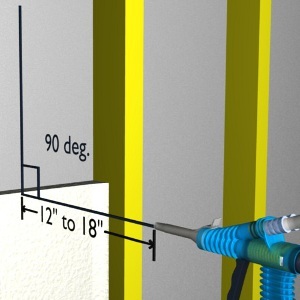 After a while of spraying, the foam can start to build up in the mixer affecting proper ratios and on the nozzle's tip restricting the spray pattern.